Книга "Highly Recommended. 1. Workbook. English for the Hotel and Catering Industry"
Характеристики книги "Highly Recommended. 1. Workbook. 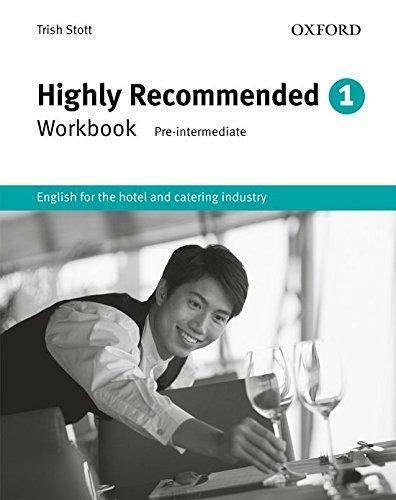 English for the Hotel and Catering Industry"
This new edition of Highly Recommended has been completely revised to take account of innovations and changing practices within the sector. Highly Recommended 1 and Highly Recommended 2 provide students with simple, functional language for dealing with customers and colleagues in a variety of situations, from taking reservations to dealing with complaints. The course offers a straightforward approach to developing speaking and listening skills in the context of the hotel and catering industry. This is a practical course for younger trainees in the hospitality and catering industry. Разделы, в которых можно купить "Highly Recommended. 1. Workbook. English for the Hotel and Catering Industry"